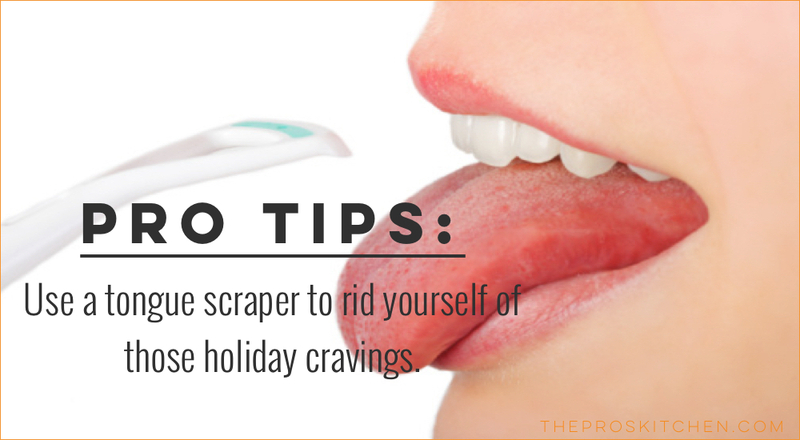 Pro Tips: How to Rid Yourself of Those Cravings from the Ghost of Holiday Dishes Past? Sometimes you literally have to just scrape that taste out of your mouth. The holiday may be in the past, but do you find yourself still having excessive cravings for that one special holiday dish? Are you finding it hard to jump back into your fresh and healthy dinner routine? Are you feeling a little like your mind is telling you “No,” but your body is telling you “Yes?” One reason you might be having such strong cravings for yesterday’s meal is because it is still, literally, hanging around in your mouth. The saying, “I want it so bad I can just taste it,” does have some truth to it. I have found that tongue scrapers, a small hook shaped tool used to gently scrape the “gook,” bacteria, food, debris, fungi, toxins, and dead cells, off of the surface of your tongue, is very useful at helping you to get rid of those unwanted cravings from a “special occasion” treat in the past that you don’t want to make a regular consumption in the future. Making use of this personal squeegee will keep you moving forward in a positive and healthful direction, even if you do take a day or two to celebrate with some of those more indulgent dishes. How do you get your health and wellness routine back on track after a holiday? Sign up for a complimentary holistic health and wellness consultation and I can support you in continuing to pursue your wellness goals.